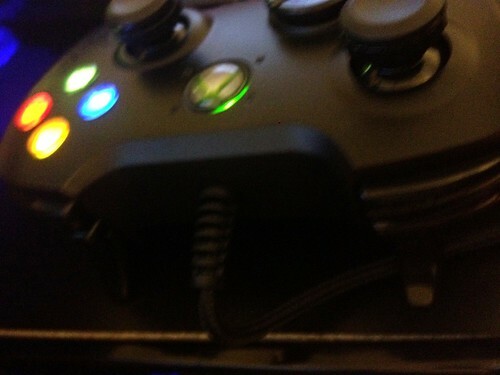 I bought the Razer Onza because I was looking for something a little bit different by way of Xbox controllers without getting a modified controller. I didn’t have a lot of options and the only directions I saw was the little light up child-like controllers or a different colored controller and that didn’t solve my problem at all. Part of the reason that I want a different kind of controller is because my hands are small and if I play for too long, they start to cramp up (that’s what she said). Seeing as I am also a blogger, programmer, and pianist, that is never a good sign in regards to my probability of getting carpal tunnel in the near future. I tried one of the smaller controllers, but it just didn’t fit in my hand right and I couldn’t get a good enough grip on it (that’s what she said…ah I could go all day) and I found it to be most uneffective. That’s when I decided on the Onza. Plus, all 3 of my roommates have one and I didn’t want to be left out and stuff. I have a Razer keyboard and mouse so I felt good about getting one of their controllers. The only big downside is that it isn’t wireless, but the cord is long enough to reach China, so the ability to sit where I normally do wasn’t a problem. I liked the fact that it was black and the buttons light up more vibrantly than the regular controller does. Not that that makes a difference, but it’s so pretty. I can turn my lights off and it’s like playing Xbox with the stars. If the stars were little buttons and a D-pad. The Onza also has 2 programmable bumpers above the regular bumpers. I, at first, was excited about that but soon realized that I kind of can’t get to the bumpers easily because I’m either aiming or firing. I ended up programming the left one to also be my sprint toggle just because my left thumb would get sore from having to press down on the analog stick (I play with the tactical set up). This trigger might be good for an RPG or sports game, but it’s not very helpful in first person shooters. 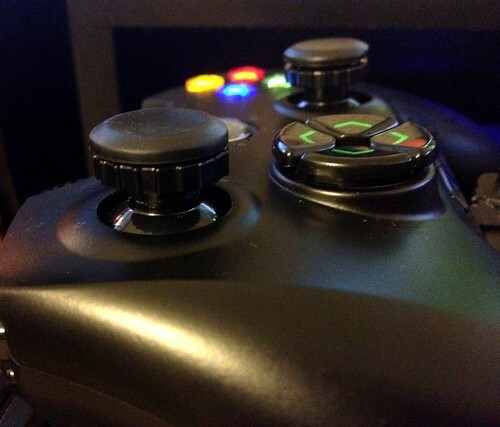 This controller also has the ability to adjust the tightness of both analog sticks. It has a little plastic piece below the thumb rests that you can twist complete with clicking sounds. That has taken me quite a while to get used to. I’m not sure if it’s because of muscle memory or my inability to handle change, but I’ve had the controller for about a week and I still haven’t been able to find a happy medium. One thing I did notice, and I do the same for my in-game sensitivity, is that I do have to adjust it for the different guns I use. If I snipe, I have to loosen them. If I use my ACR, then I have to tighten the right one a little bit more than the left, but it kind of depends on what gun I was using in the previous game. I used to play at around 6-7 sensitivity, but I have to bring it down to 5 now and don’t get me started on how much of a nightmare it is to use my MP7. It’s ridiculous. I’m keeping at it though, because I have a MOAB to get. All in all, I give this little contraption a thumbs up. If you’re looking for something different, but you don’t want to go into douche modding territory, this is the controller for you. I’m still on the lookout for new controllers to try out, so if you know of any, please let me know.